This is our large sized Specialized Demo Alloy 27.5 mountain bike for hire. 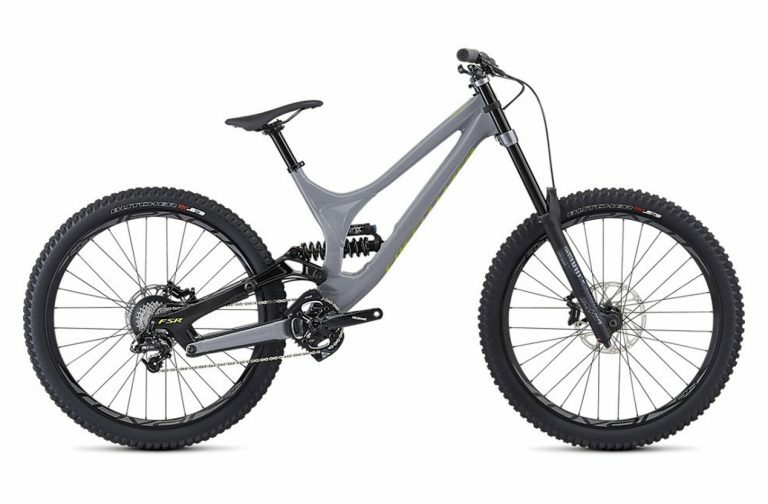 The Demo 8 27.5 is built from top spec M5 Aluminium, its Super stiff, light and incredibly strong. A thick 1.5-inch head-tube holds the RockShox BoXXer’s in place and a custom-tuned FOX VAN RC shock accompanies the stand out design of the single sided seat tube on the Demo 8’s frame. Making it feel planted is it’s S3 Geometry and 200mm of travel front and rear, add in the low BB and super short chain-stays means the Demo 8 27.5 is incredibly stable at speed over the roughest terrain you can ride. Accompanying the Fox Van shock & RockShox BoXXer kit are SRAM’s mighty four pot Guide RS hydraulic disc brakes, solid one-by-ten SRAM GX drivetrain with custom SRAM Descendant cranks and its all rolling on Roval’s 650b, aluminium 24mm wide rims that are shod with the formidable Butcher and Slaughter DH specific tyres. A compelling race machine at any price, it features an M5 alloy construction, Style-Specific Geometry, asymmetric frame design, and burly 1.5â€ forged head tube. RockShox BoXXer RC 27.5 fork offers 200mm of smooth, controlled travel.